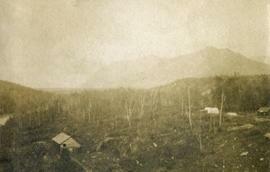 Photograph depicts newly cleared land with three or more buildings. Forest and mountains in the background. 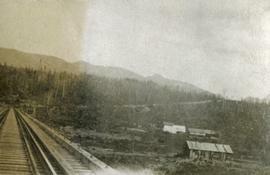 Photograph depicts looking down a railroad track on the left, a few scattered shanties in the right foreground, freshly cleared land, forest and a mountain range in the distance. 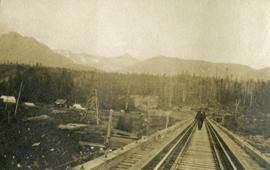 Photograph depicts a man walking toward the photographer on a railroad track. Along side the track is newly cleared land with some building and tents. Forested hills and mountains in the background. 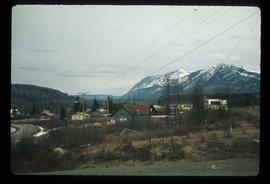 Image depicts Skeena Crossing, B.C. 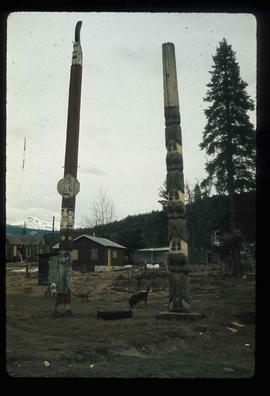 Image depicts two totem poles in Skeena Crossing, B.C. 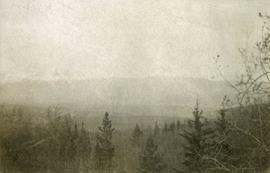 Photograph depicts a few of forest in the foreground, a snowy mountain range in the distance.